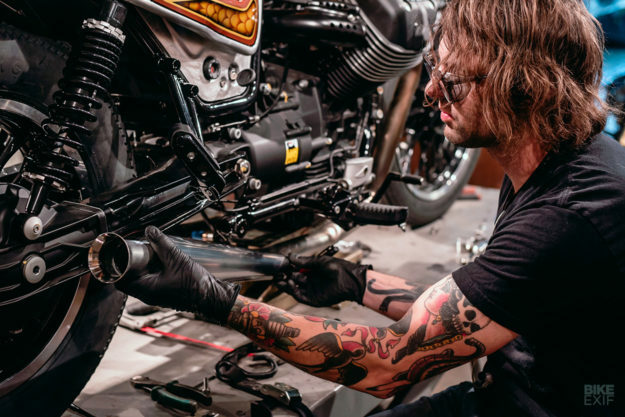 Situated at the crossroads of passion and pragmatism, the team at Revival Cycles knows when it’s time to shred the establishment, and when to walk alongside. 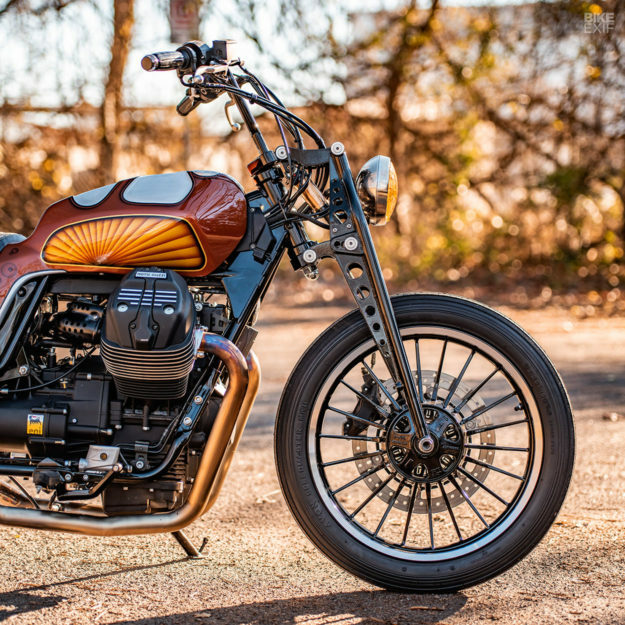 Morning Glory, a fine and upstanding Moto Guzzi V9 Roamer, is the latest display of craftsmanship and creativity to roll out of the Austin, Texas shop—and it’s an official build too. 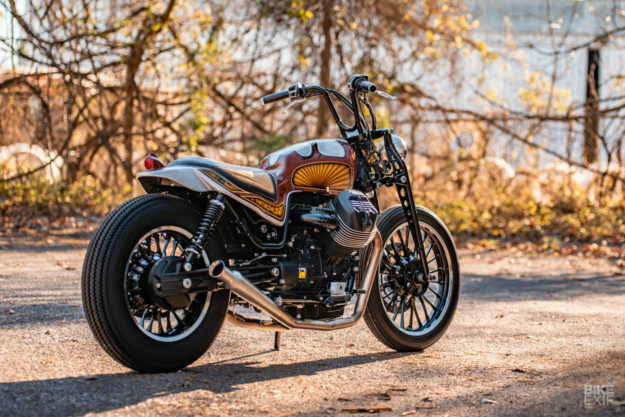 “Moto Guzzi approached us and asked if we would take one of their newly updated models, the V9 Roamer, and customize it to our liking … carte blanche with no limitations” says Revival’s top man, Alan Stulberg. Carte blanche. 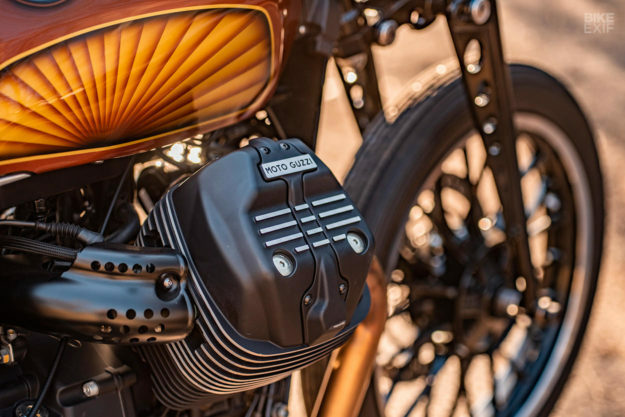 That’s a big leap for a storied manufacturer such as Moto Guzzi and Revival is a company not known for holding back. 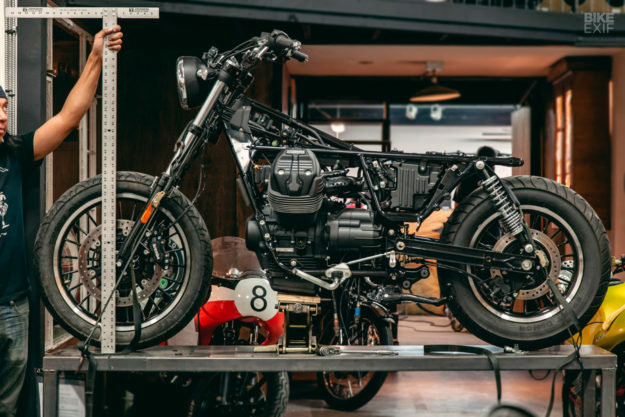 They’ve built oddities like ‘The Six’, a masterfully crafted, minimalist frame fitted with a massive Honda CBX 6-pot mill and hub steering. Plus a neon-colored Ducati ST4 Sidecarcross bike and a BMW S1000RR wrapped using ancient bodywork techniques. They’re not afraid to tear into anything. As it turns out, Revival actually liked most of what they were given from Guzzi. “That’s probably the point, it didn’t gut me to leave some things alone on this one”, Alan says with a little surprise. 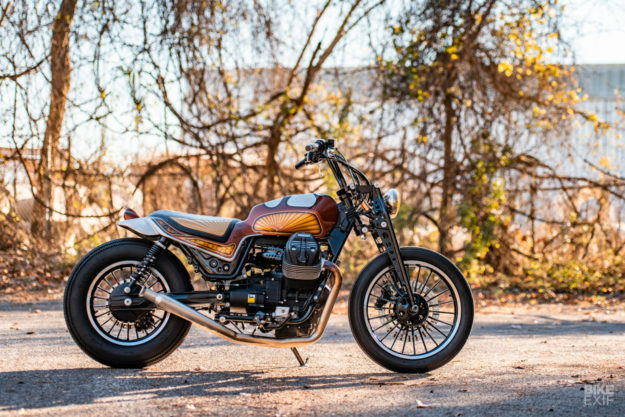 “We love Moto Guzzi, there’s so much soul and heart in these machines”. 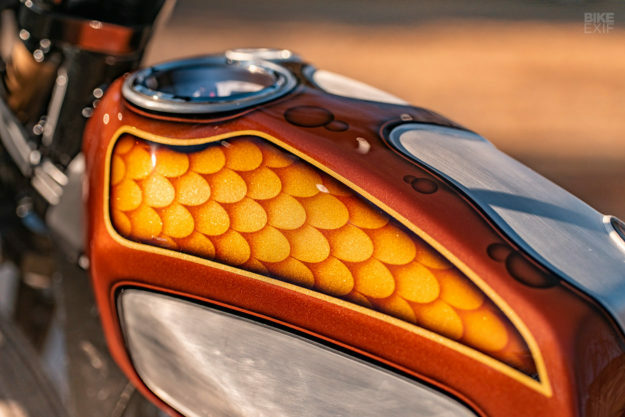 “The fish scales, high-and-tight bars, metal flake… We decided to actually stay on-brand for a change!”. On-brand? Perhaps. On point? Unmistakably. 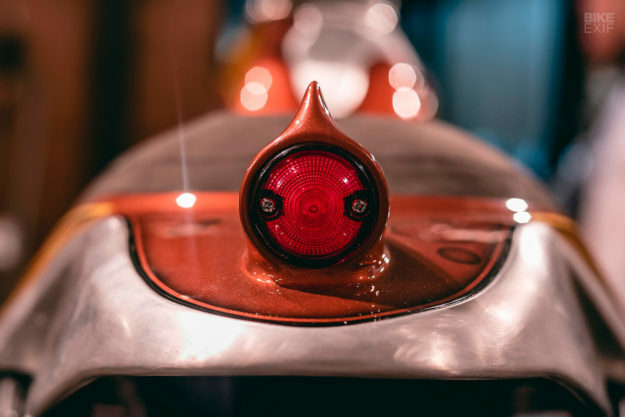 Though the stock controls from the Italian-bred Roamer stayed, the seat, tank, tail and side covers were binned and replaced with an all aluminum unibody, painstakingly hand-formed by Andy, Revival’s resident metalsmith. “Andy knew what to do. He’s a 70s kind of guy. He lives in a 1978 Bluebird bus with a tufted ceiling. He knows the 70s”, Alan says of his metal shaping master. “The idea was to create something resembling the musings of a mad scientist from the high-pile, shag carpet era”. Extensive wire framing, hammer work, shaping, welding, and polishing rendered the desired effect with enviable accuracy. 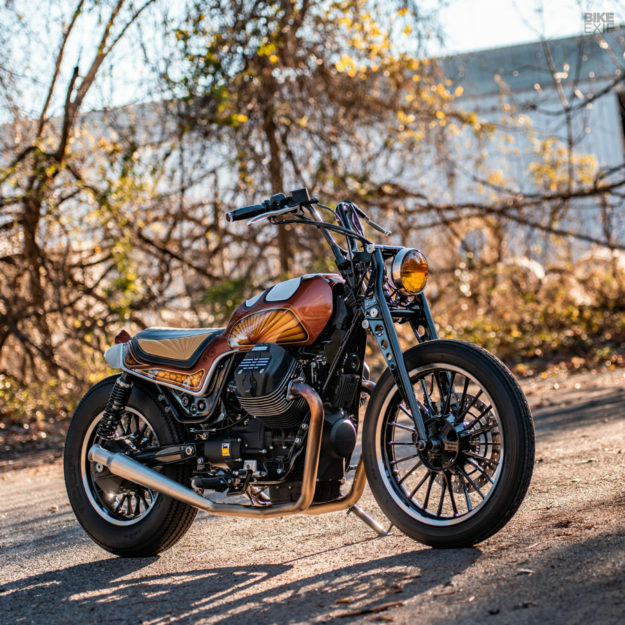 With the seat, tank and tail setting the tone, Revival looked to massage the Roamer’s stance. An aftermarket girder front end was sourced, and reworked a bit, to give the functionality desired by Revival. 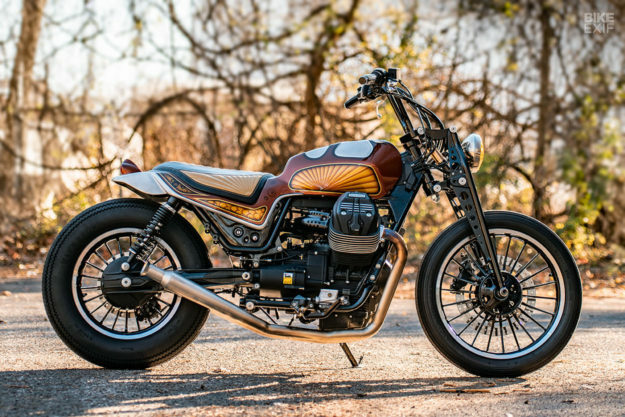 “With 4.7 inches of trail, the Guzzi has a rather stable cruising style, but still turns in well and has a reasonably light steering feel considering the narrow bars,” says Alan. 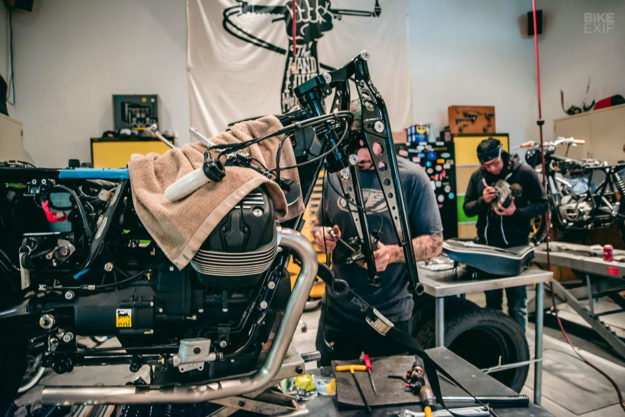 While it wouldn’t be unusual for Revival to rip the factory controls and electronics off and start fresh, the team agreed that many of components made the final cut straight from the factory. 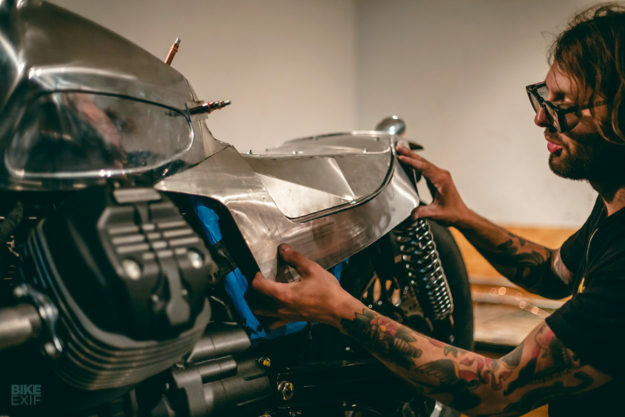 “Uncharacteristically we chose to keep the factory electronics, switches and gauge package. 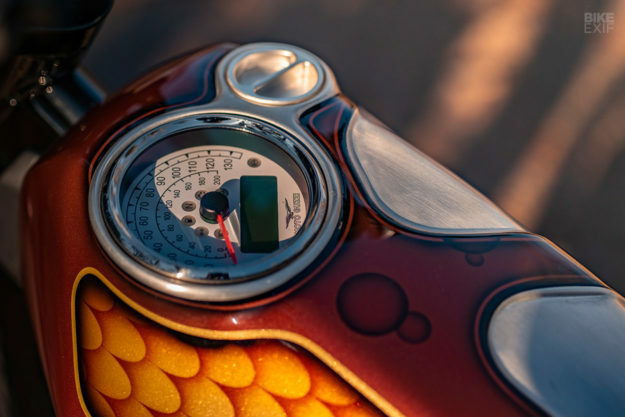 Sure, we moved the speedo and LED readout to the gas tank and set it at a crazy angle, but the factory stuff is all really well done”, Alan says. The result? A vintage whip with all things modern running the show. Passionate, yet pragmatic. If you’re traveling through the great state of Texas and find yourself in Austin, ring the shop. Morning Glory is available for rent.